This MAb recognizes cytokeratin 4, 5, 6, 8, 10, 13, and 18. This MAb recognizes cytokeratin 4, 5, 6, 8, 10, 13, and 18. 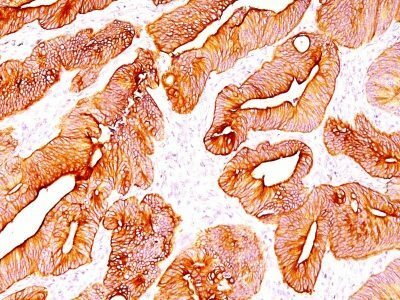 This is a broad-spectrum antibody, which has been reported to differentiate epithelial tumors from non-epithelial tumors. Many studies have shown the usefulness of keratins as markers in cancer research and tumor diagnosis. Catalog number key for antibody number 0393, Anti-Cytokeratin, multi (C11) The prefix indicates conjugation, followed by the antibody number and size suffix. Kovařik et al. Int.J.Cancer, Suppl. 3: 50-55, (1988). Vojtĕšek et al. Folia Biol., 35(6), 373-382, (1989). Vojtĕšek et al. Neoplasma 37(3), 333-342 (1990). Kovařik et al. J. Tumor Marker Oncol. 5, 219 (1990). Lane EB; Alexander CM. Seminars in Cancer Biology, 1990, 1:165-79.